After the success of the Doctor Who Series 4 soundtrack album (UK Top 50 Chart album entry and UK Chart No. 1 Soundtrack album) Silva Scree Records has released another two-disc collection of Murray Gold’s music for the long-lived franchise, this time from Series 5. Explaining the decision, the ever-humble Gold says “The last one in the same format seemed popular with listeners… if it’s too much, we’ll go back to singles.” If this album has near the success of the last one it’s doubtful that they’ll be returning to singles anytime soon. And this collection of music shows all the markings of reaching equal heights, with more epic sounding thematics and over two hours of music spanning 63 tracks and all 13 episodes. From the epically rousing grandness of “The Sun’s Gone Wibbly” with its choral back-up and pounding percussive section to the gentle hopefulnesss of “Amy in the TARDIS” (which eventually explodes into action-packed adventure), Gold proves once again that he’s not only familiar with the world of Doctor Who, butÂ knows his way around the emotions of a television episode, though he’s only been composing for a little over a decade. But even more impressive than Gold’s consistent quality is the ability for his music to live outside the realm of this televised science fiction television world and translate beautifully to a stereo system. Not all score music has that ability and it’s a powerful asset to Gold’s compositions. There’s a grandness to this entire collection of music (all 2+ hours of it) that you rarely hear in a television soundtrack album. Gold discusses his decisions for each episode in the rather brief liner notes, giving further insight into his creative process for budding composers and audiophiles alike. 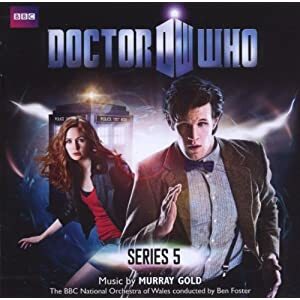 No user commented in " Music Review: Doctor Who: Series 5, music by Murray Gold "